Part I: Getting Ready to Sew. Chapter 1: The World of Sewing. Chapter 2: Assembling Your Sewing Kit. Chapter 3: Selecting Fabric, Findings, and Interfacing. Chapter 4: Working with Patterns. Part II: Mastering Basic Sewing Skills. Chapter 5: Kicking Off Your Sewing Adventure. Chapter 6: Securing Sensational Seams. Chapter 7: Fast and Easy Hems by Hand and Machine. Part III: Fashion Sewing Fun-damentals. Chapter 8: Shaping Things Up. Chapter 9: Zippers, Buttons, and Other Closure Company. Chapter 10: Sleeves: The Long and the Short of It. Chapter 11: Pockets Full of Ideas. Part IV: Sewing for Your Home. Chapter 12: Do-It-Yourself Decorating: Home Décor Sewing. Chapter 13: Quick-Change Table Toppers. Chapter 15: Adding Wow to Your Windows. Chapter 16: Giving Your Bed a Makeover. Part V: Making Alterations and Quick Fixes for a Sustainable Wardrobe. Chapter 17: When Clothes Are Too Short, Too Long, Too Tight, or Too Loose. Chapter 18: Making Repairs on the Run. Chapter 19: Eco Fashion: Giving Existing Garments New Life. Chapter 20: Ten Tips for Mixing Prints. Chapter 21: Ten Rookie Sewing Mistakes to Avoid. 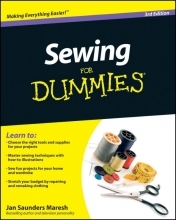 Chapter 22: Ten Important Sewing Fundamentals.